More breakfast recipes! It's an important meal, what can I say. This millet breakfast takes a few minutes to prepare and then you let it cook for 20 minutes or less. Our goal is a diet of whole grains and whole foods, and this is a good way to do that for breakfast (no bread!). 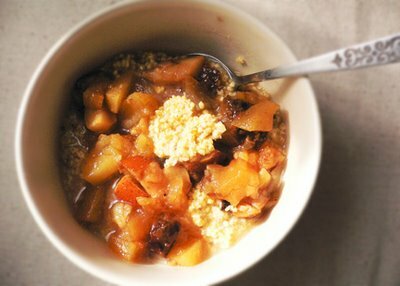 Pictured above is millet cooked with a few whole prunes and topped with some honey, ground flax seed and stewed apples. Wash and drain the millet, place in a small pot and add 1 cup of boiling water. Add a few pinches of spices of your choice, such as cinnamon, ginger, cardamom, cloves, etc. Simmer on medium-low for 15-20 minutes til almost all the water is absorbed. Stir in toppings of your choice, like honey or maple syrup, stewed fruits, apple sauce, sliced bananas, sugar-free jam, some nuts and seeds, a dollop of yogurt, etc. For extra yumminess and easier digestibility, cook the millet with some whole almonds or pine nuts thrown in, seeds or trail mix, whole prunes, chopped dried apricots, or a sprinkling of coconut. For a rich and creamy porridge, use vanilla rice milk or soy milk instead of water! Mmm...wow, I read your recipe club email and was intrigued, but after seeing a photo of this creation I am definitely sold! What did you add to that particular bowl of millet? Looks lovely! For this particular bowl I cooked the millet with powdered ginger and cinnamon as well as a few prunes. Then I topped it with ground flax seed and some stewed apples and pears which I made a few days ago. I like making stewed fruit (especially in cold weather), to add to hot cereal or yogurt, and just keep it in a container in the fridge. Your recipes are fantastic and you are helping me change my diet so much. Thank you! One question regarding millet. Is it totally necessary to soak it and other grains before you cook them? Thanks for your comments! I'm really happy you're finding these recipes helpful for your health. As for millet, it's one of the quick-cooking grains so there's no need to soak! Same goes for lentils, mung beans, split mung beans, split peas, barley and buckwheat. But dry beans including chickpeas plus hard grains like whole kamut are better soaked overnight because they're so dense. I would like to make this yummy looking breakfast, not quite sure how to go about making stewed fruit though...could you give me some guidance? Hi! I am a student currently taking a Natural Nutrition program and I just have a comment regarding soaking...although it is not absolutely neccesary, if you do soak the millet overnight with a bit of raw apple cider vinegar, you will shorten the cooking time in the morning to about 1/2 and you will make the nutrients in the millet more bioavailable and more digestible! This is true for all grains and legumes. To stew fruit, I usually take chopped unpeeled apples (and/or pears, peaches, plums) and put them in a saucepan with a little water or apple cider (or apple juice). Let it cook on medium-low for at least half an hour until the fruits get nice and soft. For flavour, I sprinkle in some spices like cinnamon, cardamom and ground ginger while it's cooking. To make it sweeter and have even more fibre I also add some chopped prunes. Stewed fruits and delicious on their own, with a drizzle of honey or maple syrup, on yogurt, with cooked plain millet or rice, and even on toast or with tea biscuits! And to the last anonymous comment, thanks for the tip on soaking millet! I never thought it needed it since it's such a quick-cooking grain, and that apple cider vinegar tip is great :-) Does it work with other grains, too? Thanks for the stewed fruit tip! I'm going to try it tomorrow morning. Regarding the soaking with raw apple cider vinegar...yes it is good to do with any grain. See one of my favorite websites... westonaprice.org and type in soaking in the search for some great info. Yes, covered, though it's not as vital as when cooking rice, so in the last while you can uncover it, give it a stir, let it continue cooking. Hope this helps, and thanks everyone for stopping by! Breakfast Recipes of this site is amazing. I like all types of breakfast recipes. They all are delicious. Most wonderful breakfast recipe! Usually I tend to steer towards oatmeal in the morning for health but it can be mushy. I love this millet recipe! It's healthy and great tasting! Plus, it makes the house smell comfy when made with cinnamon and prunes! mmmm Making another batch right now! For the record, you can't put the honey in the mix while it's boiling. It creates AMA (a toxic for the body). Better put it after. thank you for this recipe. I have an 11 month old baby and a meat loving partner and I'm looking for new creative recipes using hypoalergenic ingrediences (for my baby) and having good taste (for my partner) and this one really works for all 3 of us! We are loving it, I've made it already quite a few times and my partner is asking for more. Thank you, Vitruvia.